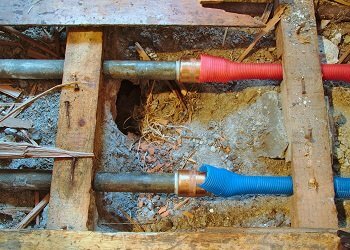 Sewer and water lines are two key components in your home's plumbing system. Keeping these parts of your plumbing system is great condition is the only way to keep your home comfortable and healthy. Both water and sewer lines are extremely important to your home, so you need to keep them in excellent condition. At Franklin Plumbing & Drain Cleaning, our plumbers are all licensed and trained professionals who can provide you with excellent sewer and water line repair, replacement and installation services in Columbia, SC and the surrounding areas. We'll be able to tackle any problems that these parts of your plumbing system develop, and we'll be able to guarantee thorough and accurate repairs. Call us today to schedule your sewer or water line services, and we'll be looking forward to working with you. Root Invasion: Tree roots grow toward moisture, which sometimes means that they can grow into your sewer or water lines. This will cause serious blockage, and the effects will be present throughout your plumbing system. Leaks: If pipe leaks aren't addressed as soon as possible, they can cause a considerable amount of water damage in a short period of time. A leaky sewer or drain line should be replaced or repaired as soon as possible. Clogs: Clogs need to be taken care of as soon as possible. If your sewer or water lines are allowed to become too clogged, you may need to have them replaced. If you need to have your home's sewer or water lines replaced, our plumbing services professionals will be able to take care of the job quickly and professionally. We'll work hard to complete the work with minimal intrusion, and we'll always guarantee your complete satisfaction with our work. For quality water lines in Columbia, SC and the surrounding areas, please call Franklin Plumbing & Drain Cleaning at 803-799-2222 or complete our online request form.